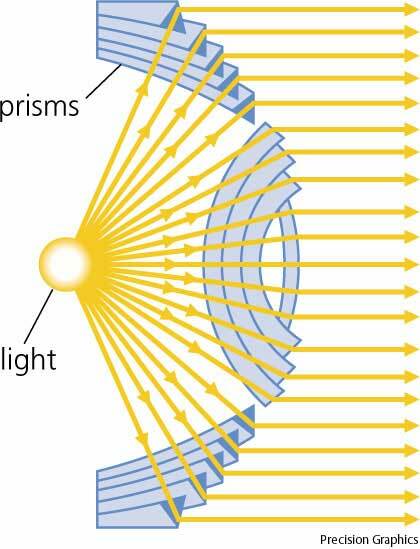 Could you please explain how Fresnel lenses work? I am asking after listening to Dr Carlos Macías-Romero talking in one of the Quantum Tunnel podcasts. Thanks a lot. Hello yet again Pablo, thanks a lot for your question. Well, I assume that you are familiar with the idea of a lens and that you may even wear a pair of spectacles or know someone who does and so you know that you can correct, among other things, the focal point and thus read your favourite blog (the Quantum Tunnel site of course!) with trouble. You can see how the lens is made out of various concentric layers of material and the design allows us to construct lenses that otherwise would be way to thick and therefore heavier. A lighthouse requires a light beam that uses a large aperture but a short focal length and a Fresnel lens offers exactly that without the need of a really thick lens. Fresnel lenses are named after the French physicist Augustin-Jean Fresnel. A couple of other uses for these lenses are in overhead projectors and the headlights of cars. So next time you attend or give a lecture or drive at night, think of Monsieur Fresnel.